A drag and drop environment to easily build your kitchen plan, then view in elevation and two types of 3D. The option of a hidden 3D drawing or a full textured 3D colour view is available with the click of a button. 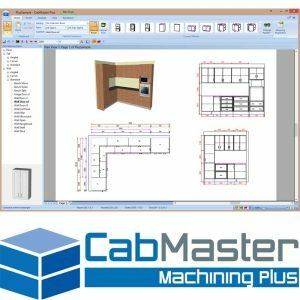 Select cabinets from a pre built library, then simply parametrically modify each cabinet individually or set your global settings any time during your job. This easily changes your cabinet construction to suit your business. Easy to set up pricing which gives you quick quotes that automatically updates as your cabinet dimensions are changed. Simply press one button to export your files, when ready to machine.